The mind is like a labyrinth- a maze that binds our soul with the body. To come out, we need to process each action carefully and then take a step. But often we are stuck in circumstances that not only prevent us from enjoying the moment but also forbid us to appreciate what is around us. 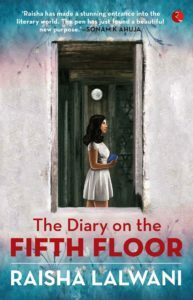 ‘The Diary on the Fifth Floor’ by Raisha Lalwani is a story written with genuine sincerity and palpable emotions. The grit and motive behind writing this piece are evident from the collection of flash fiction. These short narratives give a sense of slipping through the seams. It is commendable how minutely the author has observed things around her. What we can only mull over, she has given it a voice- a voice so strong that it resonates with the mindset of all the readers. The story narrates the experience of a young girl in her twenties, Savanna, who seeks the help of a psychiatrist to chain her fears and bring her racing mind to a halt. Dr Rama Berry is another mainstream actor in the story who is poised and graceful. Drawing upon from her experience, she guides Savanna and shows her the light at the end of the dark tunnel. Reading between the lines, we realize that we all are stuck inside a dark tunnel- the tunnel being our life. Savanna’s diary reeks of the changing attitude of people, the negativity and bitterness around. Each story in her diary possesses the stench of malice. Right from the next-door-neighbour who refuses to help in the hour of need, the treacherous nanny who uses a child as her muse to earn money, the servant who molests a kid, the swindler on the plane who manages to pilfer the jewellery to an ostentatious friend, the judgmental aunties and the ungrateful peon- all of them are pernicious and depict the crab mentality. They will go to any extent to push themselves up the bucket even if they have to stomp on others. However, the title of the book was misleading. The diary forms the pivot, yet the floor is misplaced (in the title). I think the purpose of using this title was more of using it as a clickbait title. The ending is unnerving. It is very unpredictable. Overall, the book is a breezy read and an interesting one too. For all the ones who grumble about how the society functions, this book is a must-have.